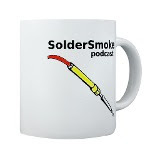 SolderSmoke Daily News: DISAPPOINTED! No Takers on Mechanical Filter Question! SAD! DISAPPOINTED! No Takers on Mechanical Filter Question! SAD! So, in our last podcast I asked the group to take a look at two pictures of a mechanical filter that I had recently taken out of its case. These pictures appear above and below. After a discussion of magnetostriction, I asked the group if they could spot anything unusual about this particular device. I expected many responses. What did I get? CRICKETS!! What is wrong with you guys? Are you spending so much time with software and FT-8 and lines of code that you can't deal with a simple analog question like this? SAD! I guess I will have to answer the question myself. Scroll down. The diagram below presents the conventional Collins arrangement for a mechanical filter. Note that at the input and at the output there is a coil. This coil creates from the signal a varying magnetic field. Because of the principle of magnetostriction, this field causes the resonators/rod assembly to flex and vibrate, much like a musical tuning fork. At the output, this means that inside the core of the output coil there is a piece of metal vibrating at the signal frequency. This will produce an output signal. But take a look at my little mechanical resonator. Where are the input and output coils? THERE ARE NONE! See those little rectangular things at either end? Those are piezo-electric crystals that are MECHANICALLY connected to the disc/rod assembly. So when the signal comes in, it is applied electrically to the piezo material which then physically vibrates. This vibration passes through the filter and to the piezo device at the other end. There the mechanical vibration results in an electrical signal at the output. So, I think it is time for you all to hang your heads in shame. Perhaps go to the doctor to see if you still have The Knack. Ask for forgiveness from the radio gods. Steve: I don't think I had previously revealed the piezo-electric transducer bit. But you may have received it by telepathy. We're oscillating on the same frequency. First I have seen this article, good one, thanks. I am saving it. But to comment mechanical filters have been around for a few decades and were well known for providing good narrow IF filtering with good skirts. But with todays modern Ham rigs with IF DSP the IF filter as we knew it has going away. Collins who made very good mechanical filters for decades has stopped for they see they are no longer needed in new designs. We as Hams still have older rigs that are not IF DSP and do need separate IF filters. I have a couple in some of my older rigs, FT817 and IC718 and they really help especially with CW. But about any rig made in last 10 years has little need. HA! I say. NEVER! The analog reistance will never give in! 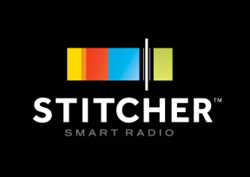 Mechanical filters, crystal filters, LC filters, coils and caps -- we will keep them all alive and on the air. Menus are for restaurants. HDR FOREVER! 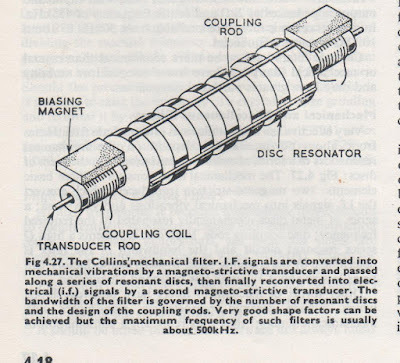 Us poor boys could only dream of a genuine Collins w/ MECHANICAL Filters! We were doing good to afford our little Heathkits or Eico rigs. We felt that we had it good if we had a audio filter using the 88mh telephone coils w/ caps. Ah... those were the days! Perhaps the reason you got no replies is that there's nothing unusual about this filter! Kokusai mechanical filters (and I think this is one) had external resonating coils. Viking Rigs Save the Day!